Archival Sources for ENGD18: Burns, Robert - "To a Mouse"
Burns, Robert - "To a Mouse"
Burns' poem is confusing at times due to its use of Scottish vernacular. 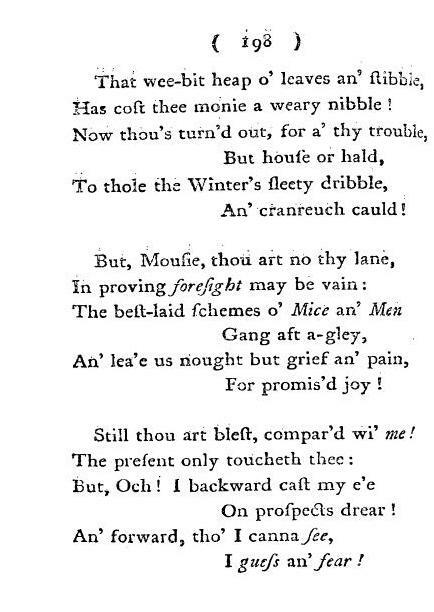 However, using Scottish vernacular makes the poem seem more spur of the moment, where a farmer looks down and sees he destroys a mouse's nest. Though he seems to pity the mouse, the speaker still mentions man's dominion over the animal kingdom. As this happens through human activity, it shows us the view, that progress will always influence our dominion over animals. 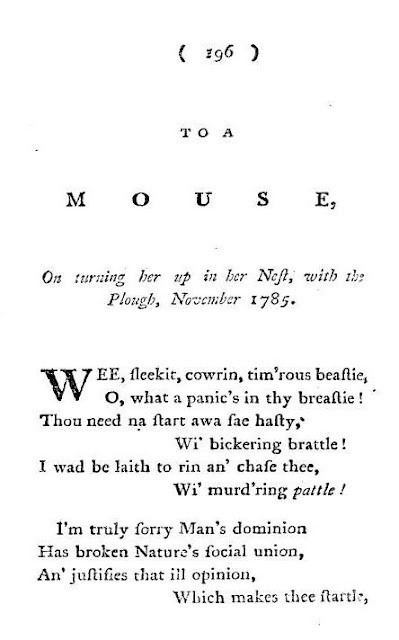 Burns' poem is not completely about a mouse, and the progress of humans over the animal world. Burns talks about living for the day, as planning can always end in disaster. Planning only leaves us with "grief and pain" and does not allow us our "promised joy." The mouse's home is destroyed, and the likelihood of survival is slim, but Burns describes the mouse as the winner in this deal, as the farmer still has worries and schemes to work through. Now because the mouse has no nest, it has to live day by day rather than planing ahead (as represented by the nest). There is no more fear of an upcoming disaster, while the farmer will have his day, as a "plough" (disaster) will one day up-turn his home. 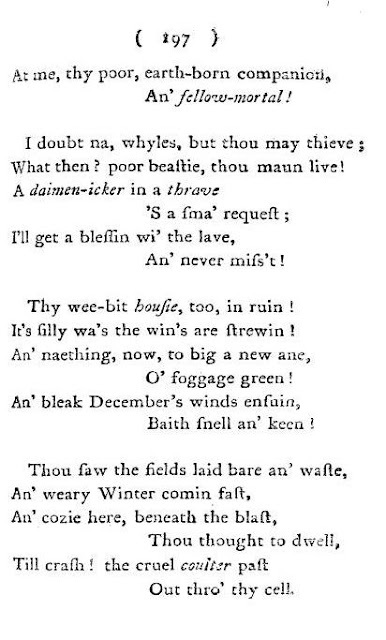 Title: Poems, chiefly in the Scottish dialect. By Robert Burns. Imprint: Edinburgh : printed for the author, and sold by William Creech, M,DCC,LXXXVII. .
Notes: Half-title: 'Poems, chiefly Scottish'. With a list of subscribers. Penultimate word of p.263, stanza 8, line 3: "skinking". Barbauld, Anna Laetitia - "The Mouse's Petition"